It’s currently 19:45 and it’s still light outside. The light is as bright as it would be on an average afternoon in the middle of Winter. In early Spring I always realize just how weak the sun actually is in the Winter. This year for the first time I’ve felt the effect of daylight savings. My mood is lifted and I’m ready for new things. I’ve also been enjoying the extra daylight to the fullest with trips to the local ice cream shop and outfit shoots past 6 PM. Despite all of the lovely things that have been happening I’ve also been feeling very under the weather. I’ve had a rough few days and really needed a little pick me up. And Then just when I was about to leave work today the mailman pulled up and delivered a surprise package! Inside was a shiny pair of new sneakers. I was never the type to wear sneakers. Sure, I’ve had Converse when they were trending in the early 2000s and yes I have Vans that I wear on almost all of my travel adventures, but overall I was always more the sandals, heels and cute booties kind of girl. When the doc recommended to stop wearing heels and things like ballet flats a few years ago, I had to recover a bit from the news. If I couldn’t wear my flimsy flats anymore, then what was I supposed to wear?! And then I fell absolutely in love with this burgundy/white pair from Veja. I doubted for about three months, but eventually went for it and bought them. They somehow manage to get me blisters on my toes (I thought sneaker were supposed to be comfy?! ), but I love them to pieces. With socks my toes are fine. 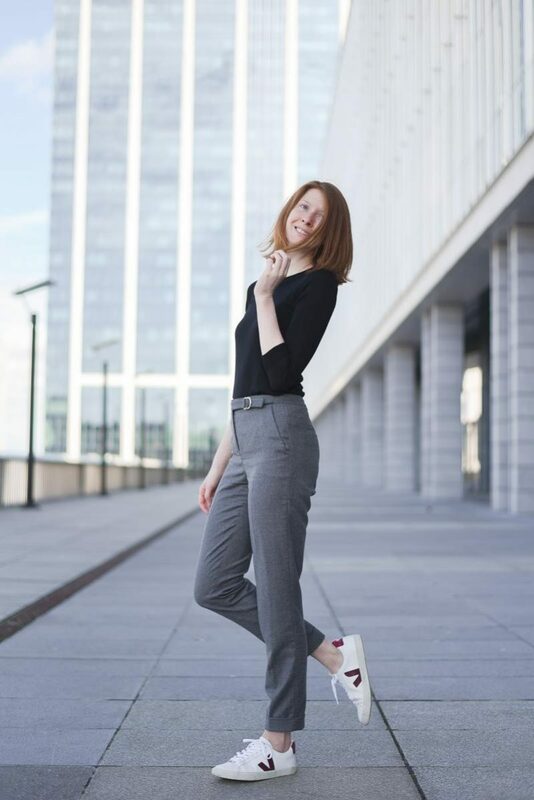 Sneakers might not be as classy as Cinderella’s glass mule, but the Veja Esplars fit me really well and thanks to the removable insole I could add the tailor-made soles that I should wear (but don’t actually own yet, haha). I’ve styled them up with jeans for play and also with these dressy trousers from Massimo Dutti for work. I haven’t paired them with my dresses yet because I’m still not sure how I feel about that trend, but since the weather predictions for tomorrow are really nice I think I might give it a go! If I like the result, I’m sure you’ll be able to see it in an outfit post soon. In the package that I received today was a second pair of sneakers that is slightly more daring than these. They have cobalt blue (my fave color!) and bright orange design details. My friends really hate the look of them, haha. I’ve put a few snaps on my Instagram stories if you’re curious to see and I’d love to hear your opinion. Are my friends right or do I – as a rookie – have a good sense of sneaker fashion? You make casual shoes manage to look so stylish! I always feel I can never lift them from casual shoes, haha. I do love my Converse though 🙂 Even if I don’t have great pants like this to wear them with, just jeans! I really like the sound of your blue and orange pair as well, I had a similar pair as a kid and I loved them until they fell apart – best shoes! Hope you are having a great week so far! Been a wet week here, but still not too cold 🙂 Glad you’re enjoying all the extra sunshine, I wish it was as bright as this at night here!